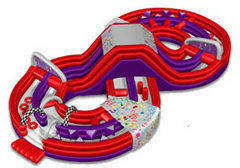 This spectacular obstacle course incorporates a brand new "Figure 8" design where you race your opponent in opposite directions instead of the conventional straight track. This enormous obstacle course stands over 24' tall and has over 100' of obstacles including, tire runs, squeeze plays, tackle dummies, tunnels, mini rock wall and a giant slide. This is the largest, most intense obstacle course to date!